The trio of these ingredients is a perfect match and a tower is a perfect way to present this masterpiece. We love to make towers for several reasons. Towers make a perfect presentation statement, you can lay the ingredients out for your guests to assemble their own towers to their taste and kids love them! The reason for using Spicewood Food Company Balsamic Vinegar Aged 18 Years is that it is like a balsamic reduction which is sweet and smooth and can be ordered on-line at Spicewood Food Company . Ingredient amounts make one tower as shown. Rinse and drain the fresh fig and slice. 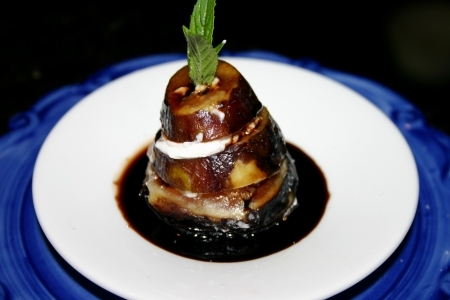 Make the tower by placing a slice of fig on a small plate, gently spread a small amount of the goat cheese, add another fig and repeat process until the figs are used. Reserve a small amount of goat cheese for the top of the tower to insert the mint sprig for presentation. Drizzle with an aged balsamic vinegar. I prefer the Spicewood Food Company brand balsamic vinegar, because it has a slightly sweet flavor that is similar to a reduction. It can be purchased on-line at Spicewood Food Company Balsamic Vinegar Aged 18 Years .